As pointed out in my previous post, I was looking into flashing the D-Link DBT-120 USB bluetooth adapter with Apple’s Bluetooth Firmware update so it becomes HID proxy-capable. Now I do not have any machine running MacOS X, so I could not simply download and run Apple’s tool and was therefore looking into alternatives, aiming at extracting the firmware from Apple’s download somehow and using other means to flash the firmware. And obviously I wasn’t the only one. In such a case you would be able to mount it with a command such as modprobe hfsplus; mount -t hfsplus -o loop example.dmg /mnt. drwxrwxr-x 17 pief users 4096 Feb 21 21:12 .
drwxrwxr-x 4 pief users 4096 Feb 21 21:12 ..
Those .dfu files are what we were looking for, because of their file sizes and, in the case of GenericCSR.dfu, also because of its file name. 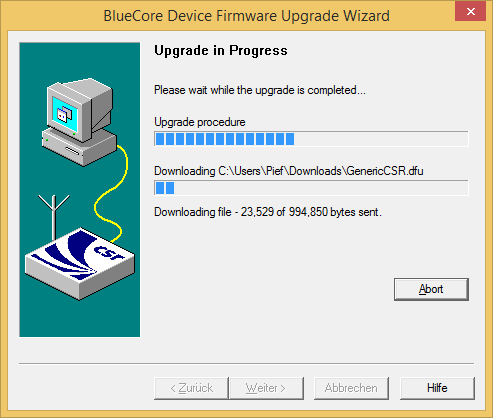 Remember, we’re going to flash a CSR-based device. Now it looks like we have three files to choose from: DeskTop.dfu, GenericCSR.dfu and Portable.dfu. “Generic” does suggest to be a good choice as “DeskTop” and “Portable” sound like firmware update files for special cases, but we wouldn’t take a bet on that. Running strings on each of them does not shed light into the darkness, however. But worry not, we’ll see more in a minute once we feed the files to the flash utility. under Linux with the BlueZ project‘s dfutool. 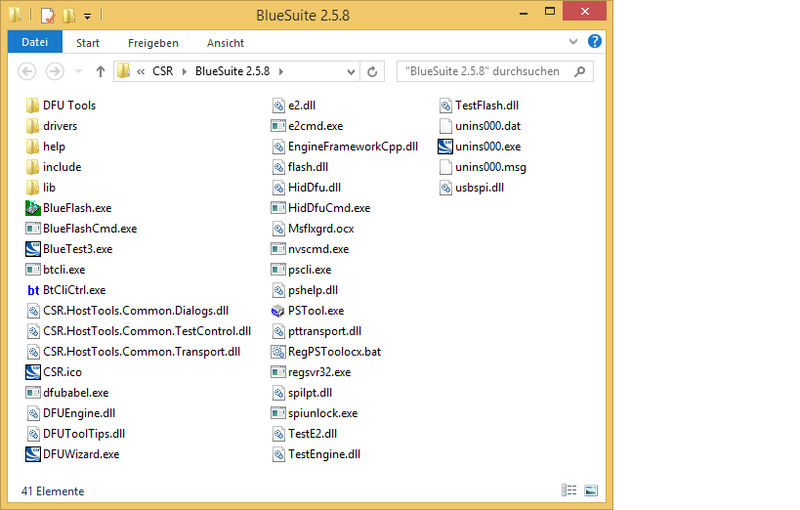 under Windows with a software suite from CSR themselves called “BlueSuite”. I played around with Linux at first, examining the D-Link DBT-120’s properties before the flash upgrade with commands such as lsusb, hciconfig hci0 version and hciconfig hci0 revision. 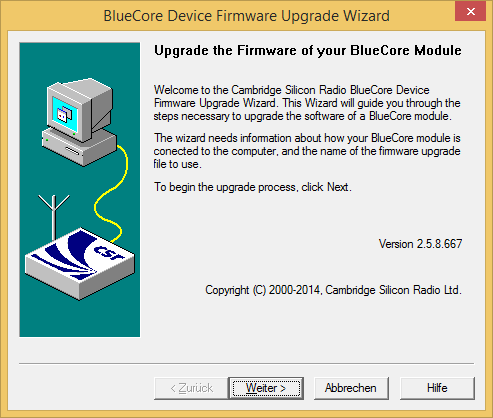 bccmd chiprev and bccmd buildname gave me an error message about an “Unsupported manufacturer”. But, more importantly, dfutool worked and I could get a backup of the existing firmware with dfutool archive dlink-dbt120.dfu. You should also have a blue Bluetooth icon in the task bar’s notification area. GenericCSR.dfu looks to be the right candidate. So we’ll use it for flashing. WARNING1: Flashing can render your device unusable, eg. if power outages occur or the wrong file is flashed. Do not perform the flashing process unless you know what you’re doing! I can not help you if something goes wrong! WARNING2: Flashing Apple’s firmware will render your DBT-120 unless you’ve taken care of obtaining hid2hci.exe! Do not ask me for this tool. Congratulations, you now have a DBT-120 adapter that behaves as a HID proxy. You should now try running hid2hci.exe and pair your input devices again. After a reboot, they should work in the BIOS as well. Remember that returning to Windows you will need to run hid2hci.exe again to get them working. A followup post will deal with automation of this. 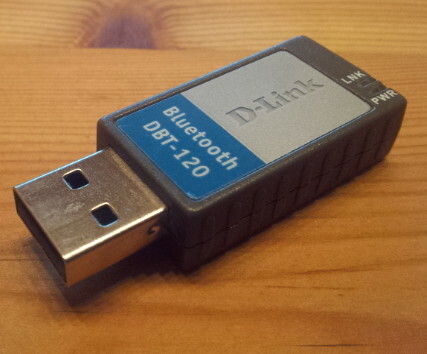 3 Comments to "Flashing the D-Link DBT-120 to become a HID proxy-capable USB bluetooth adapter"
It describes precisely the solution I was looking for in order to use my DBT-120 for keyboard input before and after MS Windows starts. 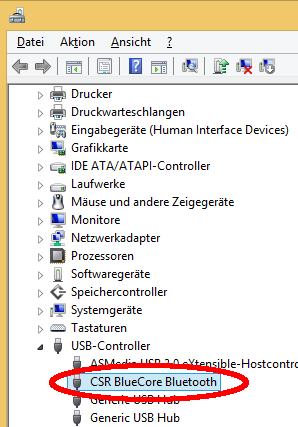 Do I need to run hid2hci.exe each time Windows starts even if I use the DBT-120 with modified firmware for keyboard input only? Or is hid2hci.exe merely needed to enable other BT services under Windows? I am asking because (if possible) I would prefer to stick with the HID proxy way of transmitting keyboard input, even after Windows is started. The latter. Running hid2hci.exe will, as the name says, switch the dongle from HID mode to HCI mode. 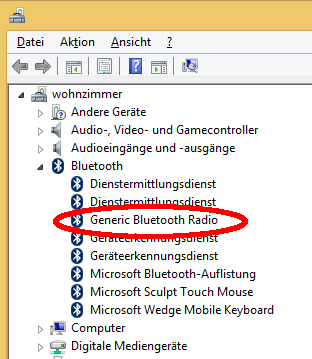 In HCI mode you need a full Bluetooth driver stack, such as the one that comes with Windows, but you will be able to eg. pair other devices. If you don’t need that, just try it out whether NOT running hid2hci.exe and leaving the DBT-120 in HID mode works for you. 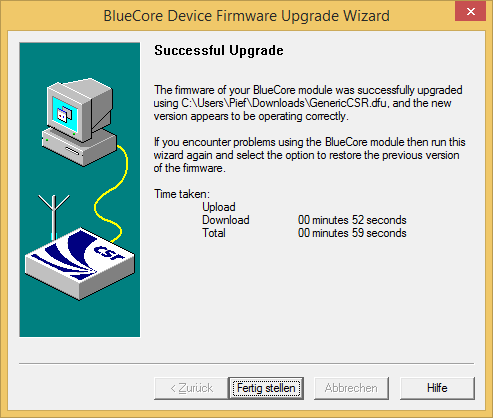 Looks like downloading the firmware loading tool is now limited to customers . Your email domain is not on our customer email list. This may mean you will not have access to all the documents you require and may lead to your requests for further access to be denied. Please contact your local CSR sales representative to rectify this http://www.csr.com/contact/sales-representatives . If you still wish to use this email address please click ‘register account’ once again.